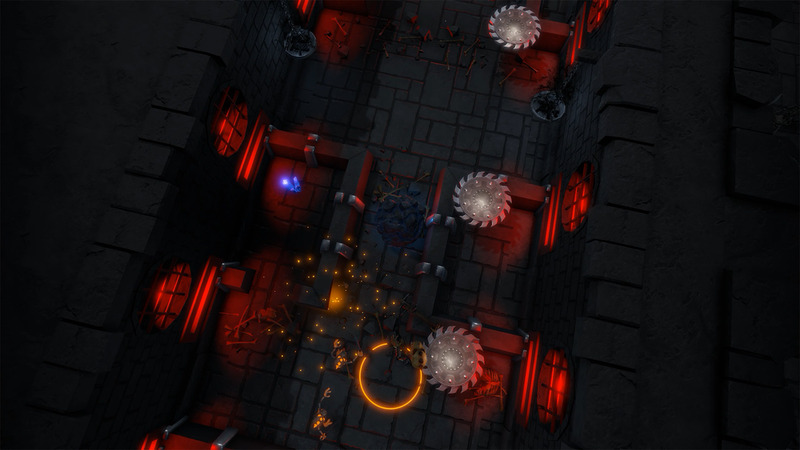 MetaMorph: Dungeon Creatures is a strategy-action dungeon crawler with fun ideas, but poor execution. The latest title from FireFly Studios tasks you with clearing room after room of enemies while swapping between a rabbit, an ogre, and a fire nymph. Although the game starts strong out of the gate, it quickly becomes a repetitive chore to earn all three stars in each level. Initially, I was granted control of a single character, a warrior rabbit with a pair of swords. Armed with basic attacks and a spinning slash ability, I made short work of the first room of enemies and was immediately granted control of a second character, a slow ogre with powerful attacks. Instead of playing as a party, I used the game’s namesake ability to change between the two characters on the fly, using abilities from both to overcome several levels. The idea of switching between the two distinct heroes was an exciting prospect; as the speedy rabbit I could run in close and attack quickly, then switching to the ogre would allow me to punish tougher enemies with proportionately stronger attacks. Unfortunately, the game rarely explores the possibilities in a meaningful way. Each level is populated by a variety of three skeleton enemies (later levels outfit them with armor), none of which require critical thought or a true tactical eye - the smaller enemies are for the rabbit to deal with, and the larger ones are for the ogre - and the few additions to the levels rarely change up the formula. For instance, I was surprised to find harmful buzzsaws flying across the map, and was happy to learn that enemies could also be dealt with using these traps. However, unless the level includes a narrow corridor in which to funnel enemies for a buzzsaw attack, odds are it's more trouble than it's worth to herd enemies into danger zones. Bombs, which are only set off when you attack them, are in a similar camp. A large cluster of bombs seems ideal for clearing lots of enemies, but if the bombs are near each other when one is set off, they'll all explode at the same time with a lot of lost potential for damage. I quickly found myself using bombs and buzzsaws rarely, preferring instead to use more dependable abilities. You'll face many hazards in the dungeons, including these flamethrowers. Each hero comes with a slew of abilities, though only two can be equipped at a time, with a third "focus" ability acting as an ultimate attack. Though the characters have vastly different abilities, only a few are very useful. The ogre can turn into a rolling boulder that smashes through enemies, but the speed and damage aren't even worth wasting the magic points. The rabbit has a lunge ability, but with its short range, there was hardly an occasion where it was useful. The same can be said for the focus abilities, the rabbit jumps four times from target to target with powerful attacks, but the game quickly begins throwing more enemies at me than even five of those attacks could handle. In short, area of effect abilities are king, but as important as they are, they're equally rare. As with everything else in the game, abilities show promise, but almost immediately fail to live up to that promise. The most bizarre part of this already strange game is the level up system. At the end of every level completion, I received a loot chest with five cards within, which corresponded to characters, abilities, or gold. Earning enough of those would allow me to buy an upgrade for my characters or their abilities, which so far has not proven to make enough of a worthwhile difference. If I earned enough stars, I could even unlock bonus levels with greater rewards in their post-level chest. Each level has three stars, one for beating it, one for rescuing the baby goblins scattered throughout each level(which is never explained), and the last for beating the level within the set time limit. Beyond opening the bonus levels and chests, there seems to be no real reason for grinding out three stars in each level, especially considering I could replay earlier levels for an easy chest. I found the inclusion of a loot chest leveling system to be completely at odds with the rest of the game, it doesn’t fit well in this title and having to deal with it at all is puzzling. Each dungeon is littered with mana potions, healing items and more traps! So far, MetaMorph seems content to be mediocre in every aspect, and the presentation itself is no different. The text throughout the game looks very plain and is a poor fit for the art direction. The music is standard creepy dungeon affair, and the sounds themselves, while nice, occasionally fail to play at all. The dungeons are filled with countless jars and pots and, though they are destructible, they never contain anything, which begs the question of why they were included at all. I found gold coins for upgrades scattered throughout the levels, but they amounted to so little that I began to skip over them, accruing most of my income from post-level gold cards. Even if I did pick them up, the way the flew into the corner of the screen was distracting and looked unintentionally sloppy. The rabbit and ogre were introduced to the game with a cutscene for each, and I awaited a third such scene to introduce the nymph, but I instead found it in a loot chest, which took away a lot of the excitement of finally gaining access to it. Most importantly, even with three characters with unique abilities, I found myself using the warrior rabbit 90% of the time, which defeats the whole purpose of the game and its primary mechanic. Many of the choices made in designing this game left me scratching my head. Ultimately, MetaMorph: Dungeon Creatures is a game that is occasionally fun, but incredibly repetitive. Using the ogre’s slam to push a small army of skeletons into a chasm is always satisfying, and picking enemies off as the rabbit is occasionally enjoyable, but the game never evolves past those moments. As a game in early access, maybe future updates will make this game less of a chore, but for now, that’s all it is.